During an impulsive visit to a psychic in New York City’s Upper West Side, young actress Gillian North learns that she has lived six previous lives—and the first five lives all ended with her murder! The sixth and latest incarnation, precisely detailed by the psychic, was in the person of Caresse LeClair, daughter of notorious nineteenth-century New Orleans voodoo Queen, Marie Laveau. Although Caresse’s ultimate fate remains a mystery, her unexplained disappearance suggests a sixth case of foul play. As her Broadway show nears the end of its run, Gillian’s performances are plagued by an increasing lack of focus. 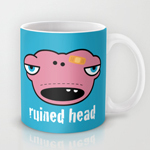 Becoming distracted to the point of forgetting her lines, she suffers from a recurring drumming sound in her head. Convinced the pounding is the insistent call of voodoo drums calling her forth to discover the secret fate of her last reincarnated life, Gillian packs a few old suitcases and travels to New Orleans. Upon her arrival, Gillian rents a room in a former carriage house that was once occupied by Caresse LeClair. With the help of her new neighbor, Ashley Talbot, a history teacher and local historian, she learns more about her former self. Although raised by Hobert Breaux, a prominent plantation owner, Caresse was of a mixed-race heritage and occupied a low position in the social stratum, elevated only by her association with the Breaux family. According to local tradition, she was involved in a love triangle with Hobert’s two sons, Beau and Lance, which eventually ended with her murder at the hands of the jealous Beau. On her first night in the old carriage house room that belonged to Caresse, Gillian is attacked and nearly strangled by a scarred, phantom attacker. Convinced that discovering Caresse’s fate will prevent the fatal history from repeating itself, Gillian sets out to investigate. She meets Andre Breaux and his aunt Claudine, the last living members of the crumbling Breaux family dynasty. Andre is immediately charmed by Gillian, and invites her stay at the family’s plantation house, the grounds of which reputedly hold Caresse’s remains, vowing to assist her in her quest to uncover the family’s dark history. After the initial attack on Gillian, not much else happens until the voodoo ceremony reveals all at the conclusion. The southern Louisiana setting provides a modicum of atmosphere, filled with ritual and superstition, with voodoo practitioners casting spells and (all too briefly) creating zombies. The “pretties” that aunt Claudine keeps in the attic also provide a brief, but creepily gothic distraction. 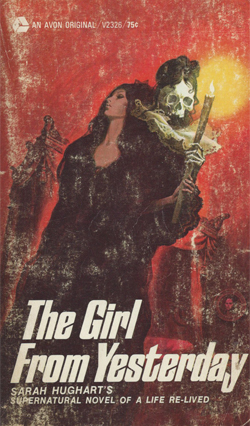 The Girl From Yesterday derives nearly all of its suspense from a game of (reincarnated) musical chairs, dancing its characters around before ultimately allowing them to settle into their assigned roles. Virtually everyone Gillian meets has a counterpart in her past life as Caresse, and the central tension in the story revolves around who will be revealed as the reincarnation of the killer. Fortunately for Gillian, identifying the attacker becomes less problematic due to the convenient, distinguishing burn that scars his face. “Look at the knockers on that one,” said an adolescent voice some distance behind her. 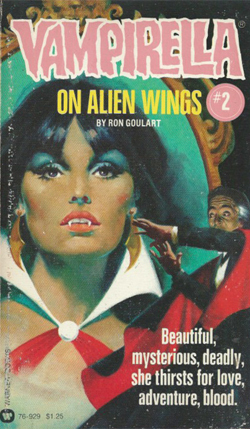 The well-endowed vampire (or more correctly, the well-endowed, blood-sucking space alien) returns in the third installment in the series of novelizations based on the original horror comic. Vampirella and the magician, Pendragon, take their act to the Caribbean island of Côte de Soleil in an effort to find the missing wife and daughter of Pendragon’s cousin. The missing relatives have fallen victim to Papa Jumbee, a mysterious voodoo priest whose zombie minions have captured them for use as human sacrifices in an upcoming ritual celebration. Although Pendragon seems unmoved by their plight, Vampirella suspects that Jumbee may actually serve The Cult of Chaos, the infernal criminal organization that she has pledged to destroy. 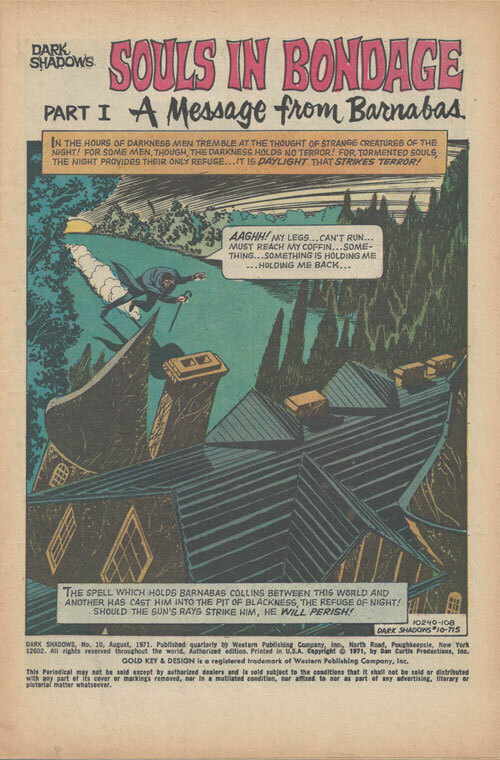 Jumbee’s henchman, between taunting epithets of “gordito” and “puta”, overcome their ineptitude and capture Vampirella, leading to one of the book’s few compelling scenes. Trapped away from the synthetic blood that sustains her hunger, Vampirella must feed upon one of her captors, leading to a blood-streaked moment of self-reflection. However, after Jumbee’s anticlimactic unmasking, Deadwalk fizzles out as Vampirella follows the trail of The Cult of Chaos to Los Angeles and London, seeking the true mastermind behind Côte de Soleil’s voodoo cult—and to another tepid confrontation. “You’ve got a terrific pair of knockers,” said the man in the powder-blue jumpsuit. Exposed to sunlight before returning to the protective confines of his coffin, on-again off-again vampire Barnabas Collins collapses into a withered heap on the lawn of the great estate of Collinwood. 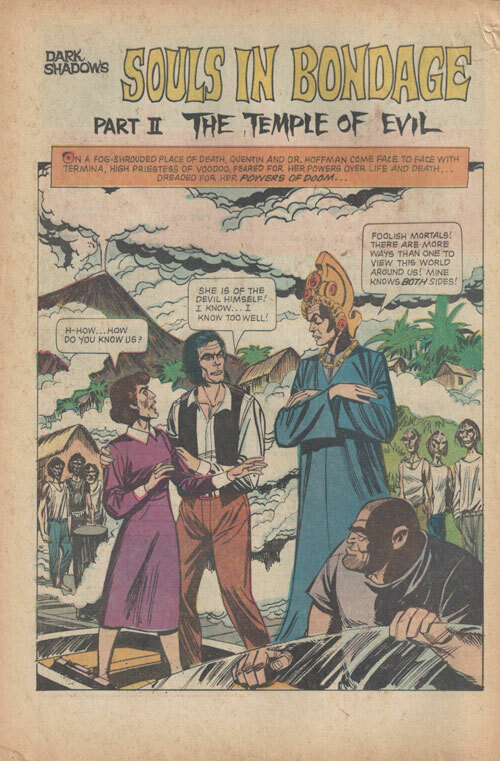 Discovering his crumpled form, Quentin Collins and Dr. Julia Hoffman notice a strange series of symbols that seem to have been scratched into the earth by Barnabas himself before succumbing to the sun’s rays. Depositing Barnabas’ remains safely in the family crypt, Quentin and Julia enlist the aid of Professor Timothy Stokes to unravel the meaning of the scribbled encryptions, and possibly save Barnabas from his fate. Quentin’s affliction, the curse of the werewolf, conveniently provides such an opportunity for her destruction. The West Indian setting offers a rare location away from the gloomy backdrop of Collinsport, with the cutout trappings of indigenous voodoo culture setting the stage for an all-too-brief monster rumble, as a wolfen Quentin faces off against a small army of Termina’s spell-controlled zombies. Although Angelique, the witch who placed the vampire curse on Barnabas, is revealed as Termina’s master, she does not appear in the story. 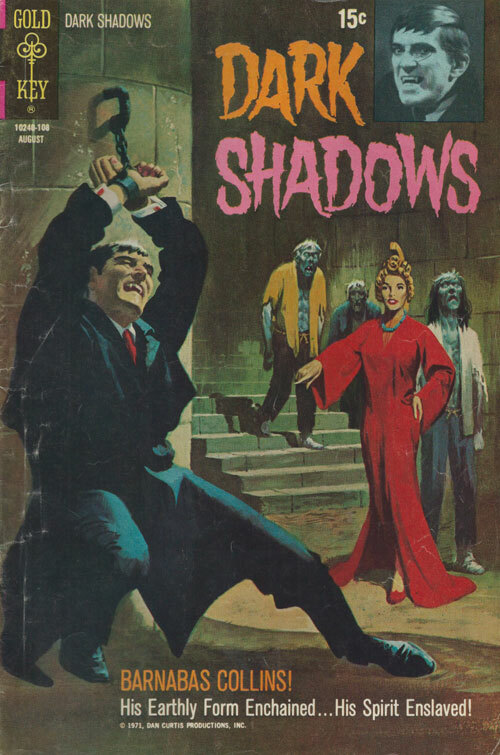 Her absence, along with that of Barnabas (who only appears briefly), leaves Quentin to carry the story—and a few panels of zombie fighting are not enough. More a series of vignettes than a single coherent story, On Alien Wings pinballs its scantily clad vampire heroine from the Hollywood Hills to a doomed cruise ship to a remote island in the Caribbean where human subjects suffer otherworldly fates. While attempting to smash the far-reaching demonic operations of the Cult of Chaos, Vampirella is relentlessly pursued by blind vampire-hunter Conrad Van Helsing, seeking vengeance for the death of his brother. Working as an assistant to small-time magician Pendragon (and transforming into a bat onstage as the culmination of his act), Vampirella books passage to work on a cruise line. But the owner of the cruise ship is beholden to the Cult of Chaos, and along with his crew of zombie minions, intends to sacrifice the entire passenger list to the demon Demogorgon. Unfortunately, this segment races to its climax without fully steeping in the potential trapped-on-a-cruise-ship-with-zombies-from-the-deep atmosphere. Following the fateful demise of the SS Triton, Vampirella and Pendragon wash ashore on a remote island, only to become victims of Jeanne Pierre Dargaud, a deranged scientist experimenting on human subjects to find a cure for his wife Monique’s strange affliction—again caused by the nefarious workings of the Cult of Chaos. Vampirella becomes the hunted in a most dangerous game, with Monique transformed by her disease into a ravenous beast. Although Van Helsing’s son Adam finds himself falling under Vampirella’s seductive spell, her character remains mostly a charmless blank-slate in this second novelization of her comic book adventures. 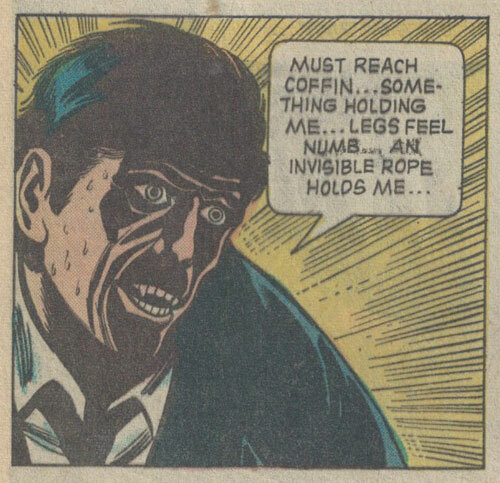 Without the visual benefit of the comic’s distinctive attire, Vampirella is again reduced to repetitive descriptions of being “long-legged”, her character shaded only by the occasional lament on her condition—usually relating to her lack of available synthetic blood. The other characters also tend to be defined by a single trait—the elder Van Helsing has psychic visions, Pendragon provides comic relief by revealing the thoughts in his head (in parentheses). Shallowly entertaining but derivative, On Alien Wings apes a number of familiar tropes across its short page count, with a few thinly developed individual story lines leading to an ultimately forgettable whole. The Guardians, a group dedicated to combating the forces of supernatural evil in the modern world, return to battle a Voodoo cult in the subterranean world below London. 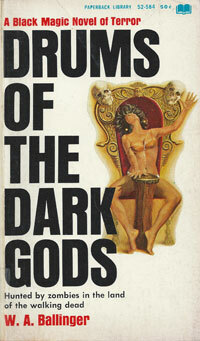 Steven Kane – a former Professor of Anthropology, expert in the field of Black Magic and de facto leader of the group. Gideon Cross – the enigmatic founder of the Guardians and master of astral projection. 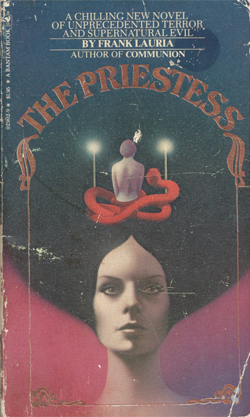 Anne Ashby – a raven-haired psychic beauty with an aversion to fire, who may have a connection to a namesake who was burned at the stake for witchcraft in the seventeenth century. Father John Dyball – a former Catholic priest and specialist in Black Magic. Lionel Marks – a private investigator handling the group’s problems on a purely physical plane. Sir Bartley Squires, a successful shipping magnate, seeks out the counsel of Steven Kane for the assistance of the Guardians in saving his daughter Caroline from an occult threat. Members of a Voodoo cult have targeted Caroline’s West Indian boyfriend, Jack Johnson, as a human sacrifice for Dambalawedo, an ancient spirit taking the form of a feathered serpent. Two other members of the Guardians, Father John Dyball and Lionel Marks, have been independently alerted to the workings of the cult, following the trail back to its leader, Dr. Obadiah Duval. 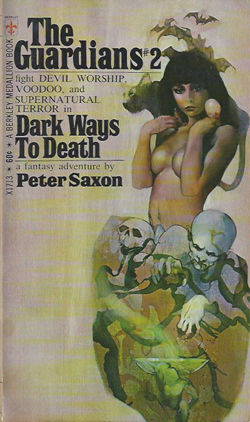 Duval operates a chemist’s shop as a front for his Dambalawedo cult in London, and has thrown down a challenge to Steven Kane and his team; he has kidnapped Anne Ashby’s black cat—and possible familiar—Bubastis, to use as a sacrifice in an upcoming ritual, and as a lure to draw out and destroy the Guardians. Their destruction will clear the path Duval has set for invoking his Old God, unleashing its great evil into the world. Venturing into Duval’s shop alone, Anne indeed falls victim to his plot, escaping only with the help of Gideon Cross—and his psychic powers traveling across the astral plane to save her. Although many lives are in peril, the Guardians spend much of their energies focusing on the return of Bubastis—probably a sore point for the potential human victims, even considering Bubastis’ special nature as a specimen of direct lineage from the cats of Ancient Egypt. The introduction of a group of slumming socialites, seeking cheap thrills at Duval’s ceremony, makes for an irritating distraction from the characters in real jeopardy. The Guardians completely fail to operate as a team in this outing, with each member fumbling around on their own—without any real coordinated plan, except to gather for a protective magic circle—towards their inevitable showdown with Duval in the abandoned subway tunnels beneath London. A creepily effective high point of the final battles comes as Dambalawedo re-animates the corpse of his fallen follower, who becomes a zombie-puppet in the control of his master. However, the conclusion cheapens whatever tension has built up, since the power to confront the Serpent God arises from an unexpected source, with little groundwork for its establishment. This newfound power reads more simply as a hastily written device to wrap up the story, rather than an enigmatic character shading to be developed in future installments of the series. Following the gruesome murder of undercover agent Marie Sainte in Haiti, Scotland Yard detective James Dobbs calls in the services of private investigator Richard Quintain. Posing as a nightclub singer in Port-au-Prince, Marie was investigating the source of a powerful new hallucinogenic drug that instantly addicts users before she fell victim to a ritualistic killing. Inspector Dobbs suspects that Quintain’s deep knowledge of voodoo will be of vital importance in unraveling the case. Quintain also has a secret weapon at his disposal, in the form of his young secretary Julie Wellsley. Beyond the superficial—and potentially sexually-harassing—pleasantries of their office banter (“Secretarial young ladies who cheek their bosses are liable to get themselves put across their bosses’ knees and have their bottoms spanked.”), Julie possesses latent psycho-kinetic powers. Unaware of her own abilities, her powers are only unlocked when Quintain places her under a hypnotic trance, and are enhanced by the psychic-amplifying nature of her virginity. Shortly after their arrival in Haiti, an attempt is made on Julie’s life, confirming Quintain’s fears of a dark power behind Marie’s murder. A controlling telepathic force impels her to walk out of her hotel room shower, and almost off the balcony. After questioning Pierre Labouche, owner of the nightclub where Marie Sainte was working, Quintain and Julie are confronted by an even greater display of diabolical power. In the adjacent cemetery, they witness a ravaged figure rising from the grave, a zombie summoned by the call of voodoo. The zombie passes them by in the cemetery, shuffling off to some other mysterious purpose. The zombies that rise in Drums of the Dark Gods play a mostly supporting role, cogs in the greater scheme of a villainous plan. Further investigation leads Quintain to the Reverend Julies Etienne, pastor of the Left Hand Path, who makes little attempt to disguise his role as an Adept of the voodoo gods of Haiti. Only Julie’s inherent power blocks Reverend Etienne’s direct attempt on their lives. Between the voodoo cult and a later encounter with the Haitian secret police, Quintain and Julie are immersed in an ever-deepening atmosphere of peril. The ultimate villain alone possesses the ability to casually destroy Quintain, except for the surprise of Julie’s psychic powers. Quintain’s relationship with her could be argued as exploitative, since he directs her while she unknowingly slumbers in a trance-like state. An alternate story could hypothetically cast Quintain as a manipulative villain, with a different protagonist working to free Julie from his controlling influence; [Insert Protagonist Name Here] battles evil hypnotist Richard Quintain in a desperate struggle to liberate his childhood sweetheart Julie Wellsley from the Svengali-like hold that threatens her freedom, and ultimately her life.